The average American consumes 23 teaspoons of sugar a day. 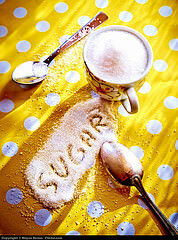 I don’t drink soda, eat convenience foods or canned fruit in heavy syrup, but I know I consume my fair share of sugar. I’ve cut down my sugar intake to only one sugar packet for my coffee in the morning, but I know I need to be more aware of the added sugar I consume on a daily basis. Even if you’ve made some dietary changes, it’s never a bad idea to evaluate what you’re eating and consider where your biggest culprits of sugar intake are. So, how much sugar should you be consuming on a daily basis? The American Heart Association recommends limiting sugar intake to no more than half of daily discretionary calories allowance. In perspective, for most women, that’s no more than 6 teaspoons per day and for men no more than 150 kcal/6 teaspoons.